One of the most coveted releases from the esteemed adidas Originals City Series, we’re pleased to bring the Dublin back into the spotlight as part of our size? exclusive Archive Collection, this time in a ‘St Patrick’s Day themed colorway. First introduced in 1976, the Dublin, alongside it’s other siblings from the City Series, was originally designed as a lightweight training shoe. Very minimal in design and material application, it made for the perfect base silhouette to apply a myriad of different renditions to sum up the personality of each of the nominated cities included in the series. 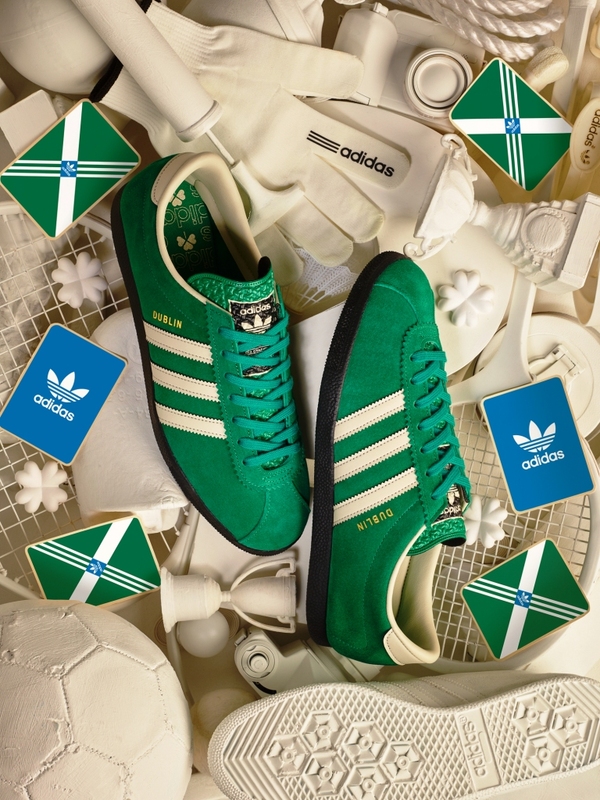 The Dublin shape itself was also replicated for the London, Koln, and Berlin releases. The three key elements to the Dublin are the smooth suede upper, dyed this time in a vibrant emerald green, overlaid with contrasting off white leather stripes, and finished off with a solid black midsole unit. The gold foil branding sits on the sidewall, and for this release we’ve even thrown in a subtle Shamrock graphic on the traditional insole branding.